Psalm 139, in the NRSV, reads “O Lord, you have searched me and known me.” The psalmist goes on to proclaim how God knows all about us. That includes our strengths and our weaknesses. As humans, we are often good at figuring out our weaknesses…what we need to work on. But, we are often less practiced on identifying our strengths. 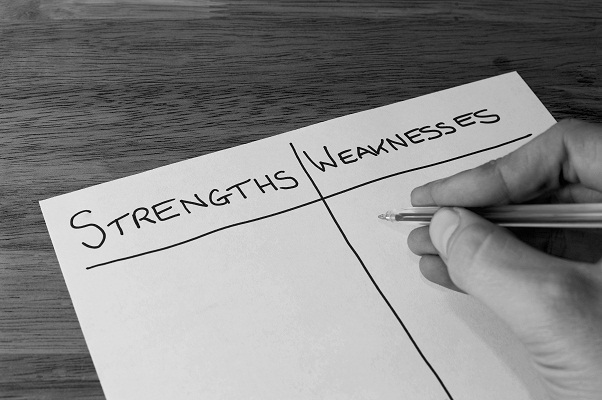 Take some time and write down what you believe are your weaknesses AND your strengths. Don’t just think about how you see yourself, but also think about how God sees you. (It may be helpful to see your strengths as your assets, and your weaknesses as areas that need improvement). Next, interview a trusted friend and ask them what they see as your strengths and weaknesses. Remember that it is often important to have someone in your life that can help you identify your blind spots and remind you of your awesome strengths. What have you been learning about yourself this week? What have you been learning about God this week? Spend time talking to God about what you are learning about yourself. Ask yourself if you are ready to share what you’re learning with someone? Ask someone to pray with you about your journey. And then, give yourself a warm hug and congratulate yourself for making it through another week of self-discovery!